We've given you an idea what is on offer this Monday at Borderlands for the avid readers among you. But what about the collectors? Books collectors and people who appreciate a first edition or a fine binding have been an important part of our clientele since the day we opened. With our sale on Monday, we're not going to leave them out. And, by the way, the copies of Worlds, The Straw Men, The Crook Factory, Clairmont Tales, and The Hemingway Hoax are all signed first editions. What the hell am I thinking letting them go at this sale? How Many Books Fit In A Bag? At the sale on Monday you get to fill a bag with books. But, in the real world, how many books is that? Thanks to some late-night work on the part of our professional models, we've got some pictures to show you exactly what a bag of books looks like. Anyway you slice it, there are some incredible deals happening at Borderlands on Monday. Just one day 'till our sweet 16 anniversary sale. Some of you might be wondering just how many books are we planning on selling at crazy prices. Well, I've just finished sorting all of them and here's the final count. 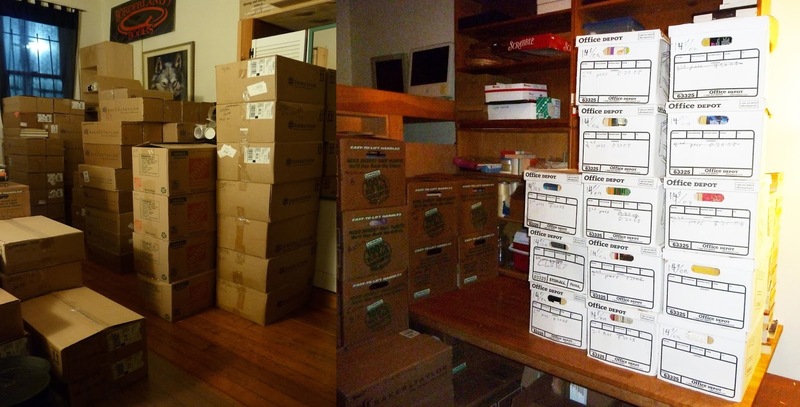 61 boxes of mass markets paperbacks (i.e. the small, pocket size ones). and 12 boxes of small press, import, and rare hardcovers. --And that's just from the angles we could reach. But, if you're ten feet tall, here's what it might look like . . .
Hope to see you Monday night at the craziest sale we've ever done. We've had a number of questions about how our 16th Anniversary Sale this Monday is going to work. Since we've never done an event like this, I didn't consider some of the questions that would come up, but several of them are good ones, hence this secondary note to clarify. The sale will be taking place in the Cafe at 870 Valencia St. It will start at 8:30 pm (or close to then). Before the sale, the cafe and bookstore will both close and any remaining customers will be asked to leave, even if they are planning on attending the sale. We need this time to set up without the place full of people. If you want to arrive early, there will be a space to line up outside the bookstore (please don't line up in front of the cafe). Bring a jacket 'cause it's likely to be cool that evening. People will be admitted based on their place in line. If there are more people in line than can be safely accommodated in the cafe, we may have to stop letting people in until some people leave. Tickets are not available in advance and payment will be at the door. Admission to the sale will cost $20 per person (cash only, credit cards and checks will not be accepted). In exchange for that payment, each person attending will be able to fill, to the top, one of our large shopping bags with books and take them home. The bags are 17 inches high, 13 inches wide, and 7 inches front to back. The books cannot extend above the top edge of the bag. After paying for admission, attendees may purchase additional bags to fill for $10 each. There will be no refunds. The books on offer will not be the usual stock of the bookstore. In fact, the bookstore proper will be closed during the sale. The majority of the books will be used, not new, although there will be a fair number of new hardcovers and large size paperbacks. Almost all the small size paperbacks will be used. There will also be a separate VIP area at the sale. Admission to that area will be $100 in addition to the $20 general admission. The books in the VIP area will be mostly rarer hardcovers and a number of limited edition small press titles from publishers like Cemetery Dance, Subterranean Press, and PS publishing. Additional bags may also be purchased in this area, but the cost will be $80 per extra bag. There will be complimentary snacks, wine and iced tea and the cafe will be serving our usual selection of teas and coffee drinks at our usual prices. The cafe will not be selling any food during the event. Our customers are, as a group, a polite, considerate and well-behaved crowd. However, sales of this sort that have a first-come, first-served element sometimes bring out peoples' less civilized qualities. So, to be on the safe side, I want to be perfectly clear - no rude, inconsiderate, or uncivilized conduct will be tolerated. That includes (but is in no way limited to), pushing, running, and shoving. It also includes shouldering other people out of the way, snatching books from other people's hands, and engaging in tug-o-war over books. Anyone engaging in rude or uncivilized conduct, as determined by any Borderlands staff member, will be evicted from the event, without a refund. This event is meant to be a fun and pleasant evening as well as being a present to you, our customers. I hope that people will be excited and that everyone attending will find a surprise treasure on the tables. However, I have seen distasteful scenes at library sales in the past and I've heard of even uglier ones. I intend to make sure that doesn't happen at this sale. In the hugely unlikely event that Jeremy, Jude and myself cannot maintain an acceptable level of decorum, I will stop the event and clear the building. We'll look forward to seeing you at the sale. I'm afraid that I don't have anything for this month's article because I'm too busy cataloging books. Which is sort of neat in its own right. Early in October I bought an entire collection (135 boxes worth of one, to be precise). Suffice to say that is _a lot_ of books. Right now the back room consists of stacks of boxes as high as my head with aisles so we can get to the back door. So, I've been spending every minute that I can spare sorting books, checking prices, and getting them onto the shelves. It's been fun. I haven't done something like this in years and it's nice to get into the "bookseller groove". It's also been fun to see how prices have changed. It's not a surprise to me that a good copy of The Outsider And Others by Lovecraft is still selling for $2000. After all, it was the first book that Arkham House ever published as well as being the first hardcover collection of Lovecraft's work. It was, however, surprising that a first edition hardcover of my friend Richard Morgan's first novel, Altered Carbon, is now worth about $300. It seems like just yesterday that we were selling those British hardcovers for cover price (plus shipping, but there you go). I also ran across one of the nicest, brightest copies of The House On The Borderlands by William Hope Hodgson that I've seen in a long time. It's a lovely early Arkham House title with full color cover art by Hieronymus Bosch Hannes Bok. Sadly the cover is quite sensitive to fading in bright sunlight so most of the copies out there have very faded spines. This one, however, does not. Quite a few nice, signed Fritz Leiber novels, including one of my favorites, Night's Black Agents. First hardcovers of all four of the Hyperion Cantos by Dan Simmons. As you may guess, it's a nice collection and I'm quite pleased to have it in the store. I'll be getting it inventoried and up on the shelves over the next month or so. If you're looking for some nice books, you might want to stop in once a week or so. Or, check our inventory online. Until next month, it's back to the computer. "Well, it's better then the Nonfiction, which is all Jesus, Jesus, Jesus." "I've got fifty-five pounds of bacon." "Excellent life advice is to never drink an alcoholic beverage that comes in a souvenir glass."